For over 20 years the small motorhome manufacturer has been meeting a customer base who want detail and quality finish. Nu Venture caters for a niche end of the market where couples want a coachbuilt motorhome, yet retaining compact dimensions. What we like: Compact, economical, easy to drive and handle, a well finished quality motorhome, compact washroom, ideal for two or a single user. What we didn’t: rear kitchen is short on workspace: wardrobe size could be too small on a long tour, no oven fitted as standard. Nu Venture is a small company operating over the road from George Orwells Wigan Pier. 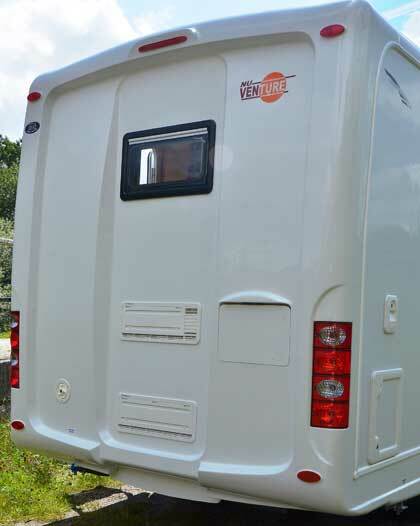 It’s not new to the motorhome business having been formed back in the early 90’s The Company then has years of experience in caravans as well as a motorhome manufacturer. For over 20 years the small motorhome manufacturer has been meeting a customer base who want detail and quality finish. Nu Venture caters for a niche end of the market where couples want a coachbuilt motorhome, yet retaining compact dimensions. Nu Venture fit this market well – now focusing on small coachbuilts they have scaled down their panel van conversion side of the business. Testing the latest Rio for 2013, our Rio was fresh from the factory having only been finished a day or so earlier. Exterior sees this Citroen based coachbuilt with quality ABS moulded panels front and rear making it look incredibly good. The mouldings are well finished off and fit well with the smooth side grp panels. Neat graphics look well with the Rio’s design. The side gas locker is mounted just over the rear offside wheel arch: its set quite high up so will need a bit off effort by the user to change to full gas bottles. Here to is the hatch for the cassette loo and filler tank point. Of course an on-board water tank is fitted, and a waste unit tank too, the Rio also has a stable entrance door complete with glazed top. 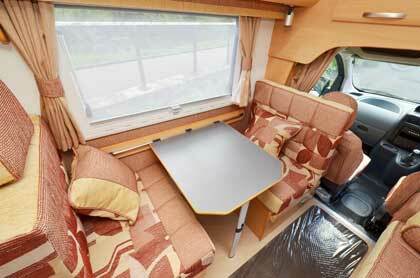 The Rio has a built in step, while two large side windows and a small rear window in the back panel is fitted too. Step inside the Rio and its compact body doesn’t feel as though the interior is going to be tight on space. The large side windows and Heki roof vent allow in plenty of natural light so making the Rio feel really airy. The light wood effect furniture also helps out here too. 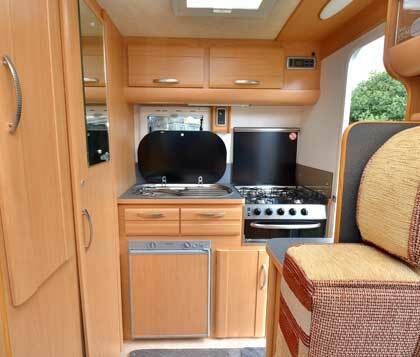 The Rio’s layout consists of a rear end kitchen, offside washroom with adjoining wardrobe and small nearside dresser and central dinette area. It all seems very practical and it is. Take the dinette: it has a single side settee while opposite a side single dinette is employed. The side single dinette is just large enough for two to use with little difficulty. Side roof lockers mean you have good storage plus both sides get a useful cubby hole too. More storage is available over the front cab with two locker cupboards all impressive stuff in a coachbuilt this size. What you will notice is the furniture finish is first class – neat and well made. Both sides of the dinette have corner spots plus a ceiling light above, so there is no shortage of night time lighting. When it comes to comfort the seating is very supportive while the soft furnishings fitted to our test Rio blended well with the furniture’s light wood finish. When it comes to making the bed up you have two options-twin singles or a double. The double makes up easily with pull-out frame extensions complete with beech slats. The side table fills the gap on the nearside single dinette to make the bed base. Twin singles can be used instead of making the double up. A small side dresser by the entrance door includes a fold down worktop along with a few shelves and drinks cabinet above. Mains and 12 volt sockets are placed here with another in the kitchen area. Opposite the dresser is the wardrobe, hanging space is restricted due to the side gas locker being placed in its base. The wardrobe lacking depth means less space for those who want to take more clothes away for a long tour. 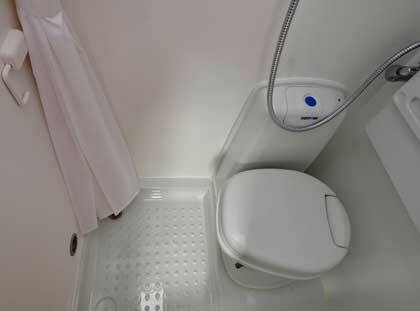 Adjoining the wardrobe is the washroom: this comes with a swivel electric flush loo plus a fold down hand basin. Storage here is limited and while the washroom is compact in size it’s useable but I feel most users will use it only in desperate measures. The end kitchen does struggle, it’s down to the vans dimensions but the designers have done a generally good job here to make the most of a compact dimension. The fridge fitted is a 60-litre unit while the cooker comes with spark ignition and four burner hob and grill, though no oven is fitted. With the absence of an oven this enables plenty of cupboard storage beneath adding to the storage provided by the two roof lockers above. Stainless steel sink/drainer is fitted as standard but this leaves little work space as already mentioned so a clip on unit may have been better here perhaps. Lighting is via a strip light while two power sockets are fitted by the roof lockers. Well the new Rio is certainly a first class finished compact motorhome, it’s hard to beat really- although it’s not a budget buy it still has good value. The Citroen will do around 45 mpg too so long distance hauls won’t be expensive. We like the practical easy design of such a smart yet compact motorhome. Two persons would find this a motorhome which they can use as everyday transport without the need of investing in a small car for instance. Spec includes blown heating, hot water and shower so the Rio owner won’t want for much. 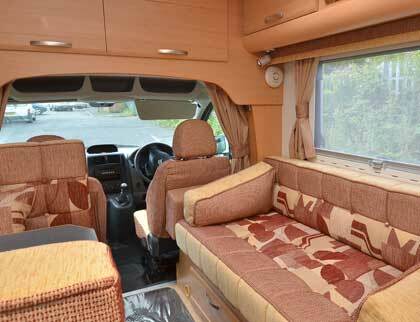 Its ideal for those wanting to trade down from a larger motorhome but not to feel short changed in the process. 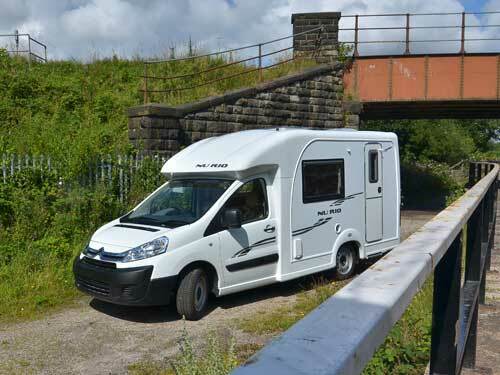 It’s very much a coachbuilt but with the ease and economy of a panel van-the Rio is a motorhome which offers so much for its compact dimensions-its pretty good then!